Afternoon Tea is unmistakably a truly British custom known worldwide, with origins in 19th century England. It can be suitable for many celebrations. 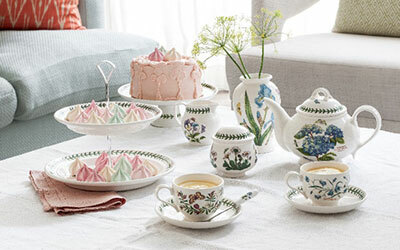 When you'd like to host a party that isn't as involved as a dinner party, a tea party can be the answer. It's an ideal format for a bridal or baby shower, a retirement party, a birthday celebration, or time to catch up with good friends. The food is prepared before your guests arrive, and is either presented buffet style or by passing plates of goodies at the table. The only thing you need to serve is the tea itself, leaving you plenty of time to relax and enjoy your guests. Afternoon tea starts with sandwiches, which are usually made with thinly sliced bread and often with the crusts removed. There will usually be both white and brown bread sandwiches. This Sara Miller London Flamingo collection dinner plate is perfect for stylish outdoor and indoor dining, and our summery Portmeirion Water Garden melamine tableware range includes everything you need for a beautiful outdoor table setting – both could make for a quirky Afternoon Tea setting, indoors or outdoors. In a traditional afternoon tea party, there is always cake - either slices of a large cake, cupcakes, or small iced buns (also known as Fancies) and not forgetting scones with clotted cream and jam. Depending on how hungry or decadent you feel there will be a slice or two of a tart. Featuring beautiful birds perched upon a leafy tree, this Chelsea Collection 3 tier cake stand from Sara Miller London Portmeirion is embellished with 22-carat gold, perfect for a special afternoon tea. 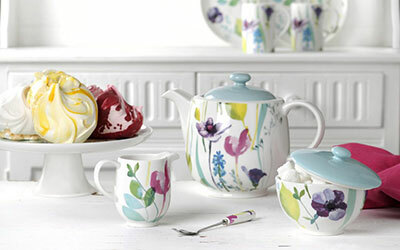 Designed for the perfect pour, this Water Garden teapot from Portmeirion is the perfect addition to any tea party. Made for modern day living, this teapot features a beautiful design bringing a splash of colour to your table. A true British classic, Botanic Garden was designed by the celebrated designer Susan Williams-Ellis. Botanic Gardens delightful mixture of pretty floral motifs and signature leaf border set a new trend for casual dining in the 1970s and today Botanic Garden looks as pretty as a daisy. This Botanic Garden Teapot features a stunning Hydrangea motif which was specially created for its 40th anniversary in 2012. Finally, when the tea party is coming to an end thank your guests for coming and invite them to return for another tea party or suggest doing another one soon. You could send them off with leftovers, if there is any! A successful gathering will strengthen the social bond between you and your guests and leave them feeling invigorated. If you wanted to go the extra mile you could prepare small gift baskets containing candles, confections or samples of tea that each guest can take with them when they leave. You could also post out thank you cards for everyone who showed up for your tea party as an extra special touch. Organise the perfect Afternoon Tea with friends and family, with your favourite savoury and sweet delights. Friendships are so important and should always be treasured. 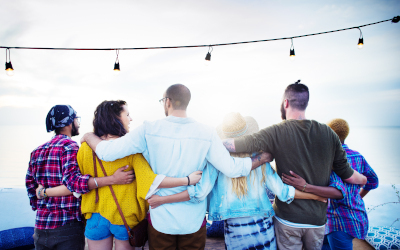 We all have friends with unique qualities that make them so special, but here are a few shared qualities amongst friends. You don’t need a reason so how your friend how much they mean to you, but if you were looking to surprise your friend with a gift, here are some ideas.